Seru Rabeni, baby Ayami and his partner, Susan McDonald in Hong Kong. According to the Pirates’ official website, the player nicknamed ‘Rambo’ was appointed in September to work alongside Craig Hammond of Hong Kong Scottish. He is “to further develop the deepening relationship between the two clubs and enhance the player development pathway and coaching effort across all age groups”. The website said he would focus on youth (Under-13 to U19) and was set to be a player coach for Pirates’ Championship Team. Also on the website, Pirates’ director of Rugby, Randal Leonard echoed the club’s delight to welcome the Bua man into their fold. In addition to his new stint as a coach, Rabeni has also embarked on a new life with Scottish expatriate Susan McDonald who is also living in Discovery Bay. 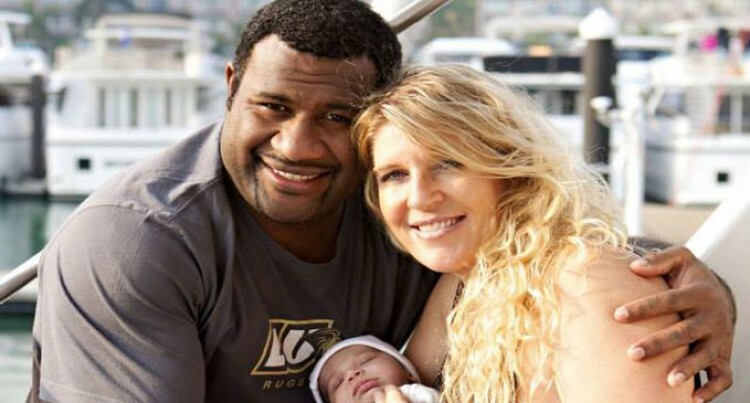 As reported by Hong Kong magazine Around DB on their website this month, “In 2010 when Seru was in Hong Kong with the Asia Pacific Barbarians, he met and fell in love with Susan McDonald, a DB resident since July 2013”. McDonald, who is senior director for Asia at the educational entertainment company LeapFrog, which is one of the DB Pirates’ sponsors, described to the magazine being immediately attracted to Seru’s “calm energy”. The article went on to detail that the duo’s relationship started out long distance, and in December 2013, their daughter Ayami was born in Hong Kong. Rabeni told the magazine he found fatherhood very rewarding, and he was already a big fan of Discovery Bay. “It’s friendly and relaxing; I feel like I’m home,” he says simply. “And I really feel myself working with the DB Pirates. “I want to maintain high standards in my own play to set an example and improve the play of those I coach. When SUNsports contacted Rabeni via Facebook, he declined to comment requesting privacy on the matter. “I would appreciate it if you respect myself and my family while we are in the process of dealing with this matter. “However, I do acknowledge your work and what you do in life. I’m kindly asking for your support while we are dealing with this case as a family matter instead of a public issue. “If there is anything to say after that, I will let you know,” he stated.